Will County, 1841-1848. Philip Leslie Biggins was born in 1841, in Lockport, DuPage Township, Will County, Illinois. In 1840, there were 26 states in the Union, the last being Michigan. William Henry Harrison was President of the United States. DNA test results for a great grandson of Philip, Peter Biggins, show that he matches up fairly closely with descendants of the Three Collas, who lived in fourth century Ulster. Surnames of these descendants include Maguire, McMahon, Carroll, McKenna, and McDonald. See DNA of the Three Collas. There is a close match for Peter Biggins and Sean Biggins, a descendant of the James Biggins who lived across the road from Philip's family in Will County, Illinois. The test results also show that Peter and Sean match up fairly closely with a John Little whose father was known as "Jimmy Beggins." Philip was the fifth child of Patrick and Bridget Biggins, who had immigrated from County Mayo, Ireland, to Ontario, Canada, to Lockport in the 1830s. Their earlier children were a girl born in 1826-30, Ann in 1835 in Ontario, Francis in 1838 in Illinois, and Catherine in 1840. In 1843, Philip's sister Rosanna was born. In 1846, Philip's brother James was born. Lockport is 35 miles southwest of downtown Chicago. The town got its name and its start in 1836, when the Commissioners of the Illinois & Michigan Canal selected it as headquarters for the canal and site of Lock No. 1. Six Sections from the DuPage Township plat map for 1873. The Patrick Biggins land is outlined in red: the 1848 plot to the south, the 1866 plot to the north. The road running east-west between the two Biggins plots is Normantown Road. The Sprague school is to the right of the 1866 plot. The road running past the Sprague School is Joliet Road. The road running diagonally north of the 1866 Biggins plot is Naperville Road. The James and Owen Biggins land is outlined in blue. The road running diagonally through the James Biggins land is now Interstate 55, which runs between Chicago and St. Louis. Romeoville, 1848-1875. On September 11, 1848, Philip's father Patrick Biggins purchased 160 acres of land from the Illinois & Michigan Canal Commission for $640. The land was on the south side of what is now the equivalent of 755 W. Normantown Road in Romeoville, Illinois. The western 80 acres is now a subdivision called Lakewood Estates. The eastern 80 acres is now the Beverly Skoff Elementary School and the John J. Lukancic Middle School. Philip's father Patrick farmed the land he bought. So, Philip, from age 7, grew up on a farm. Sprague School. Located on the Thos. J. Sprague farm. Source: Fountaindale Historical Society. 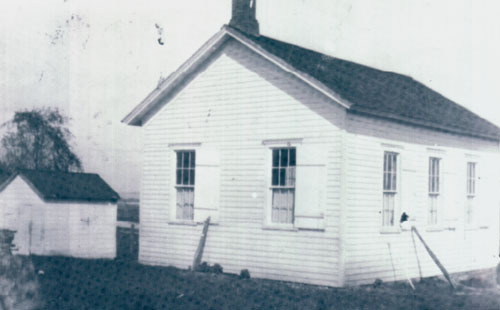 Philip attended Sprague School, a one-room school house on the Thos. J. Sprague farm that abutted the Patrick Biggins farm on the east. The school was on the northwest corner of Normantown Road and Joliet Road. School attendance did not become compulsory in Illinois until 1883. The picture and information about the school were provided by Dorothy Hassert of the Fountaindale Historical Society, which is part of the Romeoville Public Library. In 1855, Philip's sister Ann married Hugh Gaffey. Philip's mother Bridget died sometime in the 1850s, when he was between age 9 and 19. On June 23, 1866, Philip's father Patrick purchased an additional 160 acres on the north side of Normantown Road, just east of the original 160 acres, for $6,500. In 1874, Patrick's children bought his land for $13,700. Philip, 33, acquired the western half of the 1848 plot for $2,600. Francis, 36, acquired the eastern half of the 1848 plot for $4,000. In 1876, Francis sold this land to Catherine for $4,000. James, 28, acquired the western half of the 1866 plot for $3,100. Catherine, 34, acquired the eastern half of the 1866 plot for $4,000. In April 1875, Philip's brother James married Elizabeth Healy. Vermont/New York, 1846-1849/53. Sarah Ella McNally was born in May, 1846, in Vermont or New York. In 1846, there were 28 states in the Union, the last being Texas. James Polk was President of the United States. Sarah was the third child of James and Bridget McNally, who immigrated from Ireland to Vermont or New York sometime before 1841. James worked as a farmer and a laborer. Sarah was born in Vermont based on the 1870 and 1900 censuses. She was born in New York State based on the 1860 and 1880 censuses. Sarah had an older sister and brother born in New York State: Ellen in 1841 and Henry in 1844. In 1849, Sarah's brother James was born. He was born in New York State based on the 1870 census and his death certificate but Vermont based on the 1860 census. Illinois, 1849/53-1853/55. Sometime between 1849 and 1853, the McNally's moved to Illinois. In 1853, Sarah's sister Catherine, who was called "Kitty," was born in Illinois. Washington Township, Winnesheik County, Iowa, 1853/55-1857/58. Sometime between 1853 and 1858, the family lived on a farm in Iowa. Tax receipts for 1855 and 1857 indicate that James McNally owned 160 acres of land in the northeast corner of Iowa - 30 miles south of the Minnesota border and 40 west of the Wisconsin border (Mississippi River). Specifically, it was in Section 31 of Washington Township in Winnesheik County, 5 miles south southwest of Fort Atkinson. Chicago, Loop, 1857/58-1870. After Iowa, the McNallys moved to Chicago, Illinois, in an area now called the "Loop". Beginning in 1858, the Chicago city directory shows James working as a laborer and the McNallys living at 241 Sherman, the rough equivalent of 999 S. Financial Place today. This was a block south of St. Louis Church, a French parish that included many Irish. It was founded in 1850 and destroyed by the Chicago Fire of 1871. In 1857, Sarah's sister Ellen, 16, married John Dempsey, a railroad flagman, born in Ireland. In 1861, Sarah's father James McNally died in Chicago at age 41, leaving a wife and five children. Sarah's mother was 41. Ellen was 20 and married with two children. Henry was 17. Sarah was 15. James was age 12. Kitty was 8. Sarah's father was buried March 19 in Calvary Cemetery in Evanston, Illinois, in Section D, Block 9, Lot 11. The plot is unmarked, but located just south of a grave marked �Maloney.� The cemetery lot was purchased in 1861 by Bridget McNally and her son-in-law John Dempsey and subsequently included a number of Dempseys and McNallys. Pittsburgh, Fort Wayne & Chicago Railroad. In 1862, Sarah's brother Henry married Margaret. Henry worked for the Pittsburgh, Fort Wayne & Chicago Railroad. He started as a switchman and worked his way up to yardmaster. The "Fort Wayne" started serving Chicago on Christmas Day of 1858. It was a major connection to the East Coast, eventually becoming part of the Pennsylvania Railroad System, then the Penn Central railroad, and today Conrail. Chicago, Bridgeport, 1870-1875. In 1870, the McNallys moved to the Bridgeport section of Chicago. They purchased a house at 228 Archer Avenue (2321 S. Archer Avenue after 1881). This is on the south side of Archer Avenue at 23rd Place. The 1870 census indicates that Sarah's mother Bridget owned the house and that it was worth $1,400. Today, the Golden Dragon Fortune Cookie Company occupies the site. Bridgeport was the eastern end of the Illinois & Michigan Canal and had become part of Chicago in 1863. The McNally house was just west of Hanover (Canal) Street and south of the Chicago and Alton Railroad tracks, which ran along the south bank of the Chicago River. In 1870, Archer Avenue was a dirt road used to drive cattle to slaughter. The section of Bridgeport where the McNallys lived was a mission of St. Bridget parish, which had been founded in 1850 at Archer Avenue and Church Street. Every Sunday a priest would say Mass in a rented store located at 26th and Lowe. In 1875, All Saints parish was carved out of St. Bridget�s parish, and Father Edward Joseph Dunne was made pastor. The new parish extended from the river south to 31st Street and from Wentworth east to Halsted. The first Mass was said on August 15 on the first floor of a two story building. School opened two weeks later on the second floor. In 1893, Pope Leo XIII made Father Dunne the second Bishop of Dallas, Texas. All Saints Church is now St. Anthony-All Saints Church, 518 West 28th Place. In 1875, Sarah was working for Burley & Tyrell, wholesalers of china, glass, and queensware at 83 State Street. Philip Leslie Biggins, 34, and Sarah Ella McNally, 29, were married at Sarah's home on August 26, 1875. They were married by Father Edward Joseph Dunne, pastor of All Saints parish, which had just been carved out of St. Bridget parish in Bridgeport. The marriage took place at Sarah�s mother�s house at 228 Archer Avenue (2321 S. Archer Avenue after 1881) in Bridgeport. Witnesses were Sarah�s sister Kitty and her brother James, in addition to Joseph Fitzpatrick and Brigitta Cunningham. 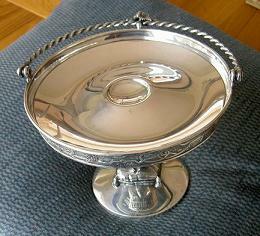 Silver Compote Dish, with its pedestal, is 6½" high and 9" in diameter. Engraved with �Sarah 1875.� Click here for larger picture. Underneath is the inscription: "MF'D & PLATED BY REED & BARTON 3080." 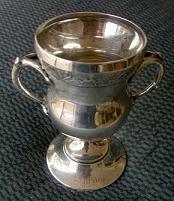 Silver Spoon Holder, with a short pedestal and tree branch and acorn handles, is 5½" tall and 3" in diameter. Engraved with �Sarah 1875.� Click here for larger picture. Underneath is the inscription: "MF'D & PLATED BY REED & BARTON 310." Sarah�s boss at Burley & Tyrrell gave them two Reed & Barton silver pieces: a compote dish and a spoon holder, each engraved with �Sarah 1875.� Sarah Biggins Kelzenberg was given these pieces by Emily Foy Biggins. The compote dish, with its pedestal, is 6½" high and 9" in diameter. The spoon holder, with a short pedestal, is 5½" tall and 3" in diameter. Romeoville, 1875-1885. Following their wedding, Philip and Sarah lived on the family farm in DuPage Township on the south side of what is now the equivalent of 755 W. Normantown Road in Romeoville, Illinois. Although the farm had been split up among the children a year before the marriage, they probably continued to operate it as one farm. In 1879, Sarah�s brother James died at age 29 and was buried at Calvary in the same unmarked lot as their father. In January 1877, Philip and Sarah's first child, Philip Leslie, was born. He was known by his second name, Leslie. In 1880, Philip and Sarah's second child, Arthur, was born. Philip's father Patrick Biggins died on April 10, 1882, at age 75. The Will County Commercial Advertiser reported the day after that �consumption, that relentless destroyer of man, was the disease that sought and finally carried him to his long home the morning of April 10th.� Funeral rites at St. Dennis Church included Solemn High Mass. We do not know for sure where Patrick and Bridget Biggins are buried. However, there is a large limestone tombstone in St. Dennis Cemetery at 17th and Jefferson Streets in South Lockport with the name �Biggins� in large letters. The rest of the tombstone is illegible. Naperville, 1885-1897. In 1885, Philip and Sarah moved 10 miles north to the east side of Naperville with their sons Leslie, 8, and Arthur, 5. They still owned the 80 acres of farmland in DuPage Township. Leslie and his brother appear in the school census for Lisle Grade School (Ellsworth School after 1891), but it is not clear whether they attended that school or the Catholic school in SS. Peter and Paul parish. Naperville is in DuPage County. 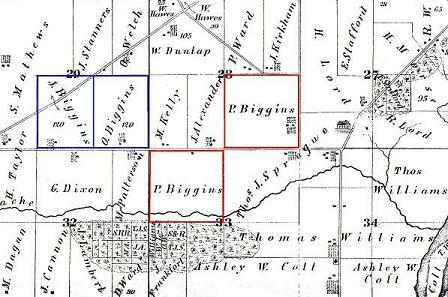 The Biggins farm was in DuPage Township in Will County. Also in 1885, Philip's sister Catherine and brother Francis moved to Joliet. They lived at 406 Western Avenue. Their brother James and his wife Elizabeth remained on the family farm. On July 25, 1885, Sarah's brother Henry McNally, 42, died on the Near North Side of phthisis pulmonalis. In 1889, the Will County Circuit Court ordered the Sheriff to sell Philip�s 80 acres and his brother Francis� 40 acres to Fithian & Cowing to settle debts. Each had 15 months to redeem the property. Philip�s debt was to the estate of Barrett B. Clark. Francis� debt was to the estate of George J. Munroe. In 1887, Sarah's sister Catherine married Patrick White in Chicago. On March 16, 1890, Philip's brother James died. He was buried in St. Dennis Cemetery at 17th and Jefferson Streets in South Lockport in a plot that is separate from his father's. 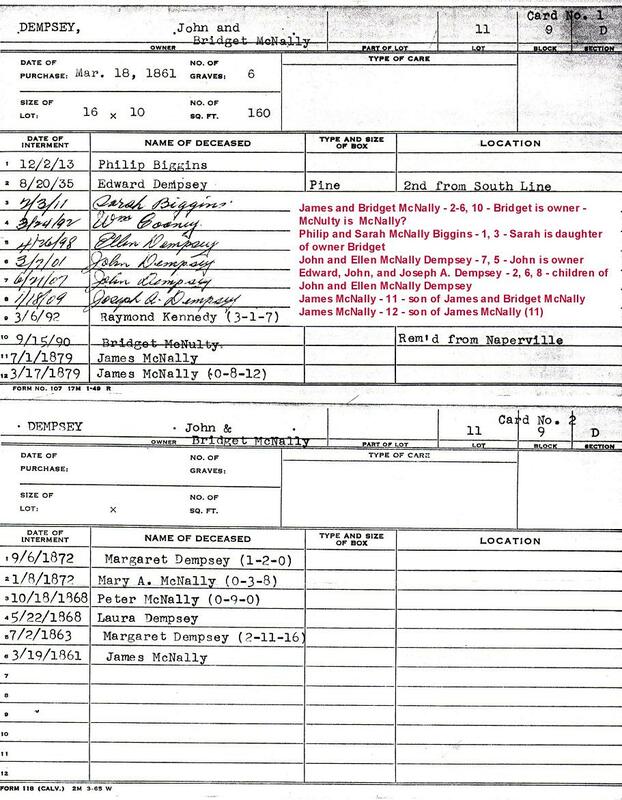 We are not sure when Sarah�s mother Bridget McNally died or where she is buried. The Calvary cemetery plot that Bridget purchased in 1861 with John Dempsey includes a Bridget McNulty buried September 15, 1890, with the note �rem�d from Naperville.� This may be Bridget. She would have been 70 years old in 1890, but may have died earlier. 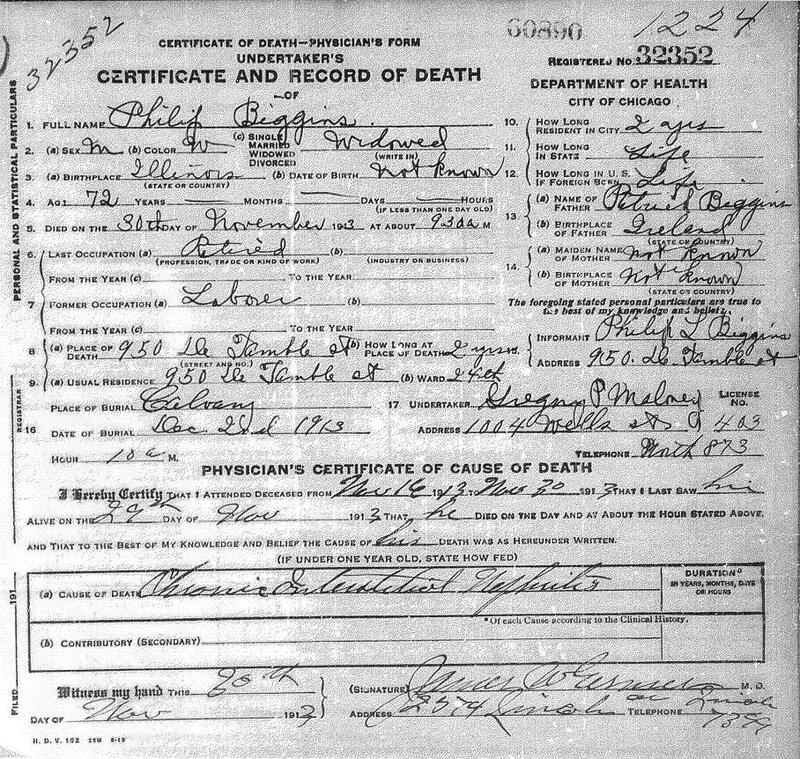 The Will County Coroner�s Record of September 24, 1891, which is in the files of the Will County Historical Society, reported that Philip's brother Francis was run over by a Chicago & Alton railroad train in Lockport while trying to board it under influence of liquor. Chicago, West Englewood/Englewood, 1897-1901. In 1897, Sarah moved to 6239 S. Bishop Street in the West Englewood community on Chicago's south side. The 1897 city directory lists Sarah and Leslie but not Philip. In 1898, they moved a few blocks to 6025 S. Throop Street. The 1898 directory lists Sarah as a widow. Subsequent sources show that Philip did not die. Philip and Sarah were evidently separated, however, for a couple of years. On April 23, 1898, Sarah's sister Ellen McNally Dempsey, 57, died in Bridgeport of uraemia. She was buried in Calvary Cemetery in Section D, Block 9, Lot 11. This plot had been purchased by Sarah's mother Bridget and Ellen's husband John Dempsey to bury Sarah's father in 1861. The 1899 city directory shows Philip, and presumably Sarah, living at 1204 W. 63rd Street (1104 W. 63rd Street after 1909) in the Englewood community. Philip was working as a car repairer. Also living at that address under the name Biggens was their son Arthur, who was listed as a machinist. 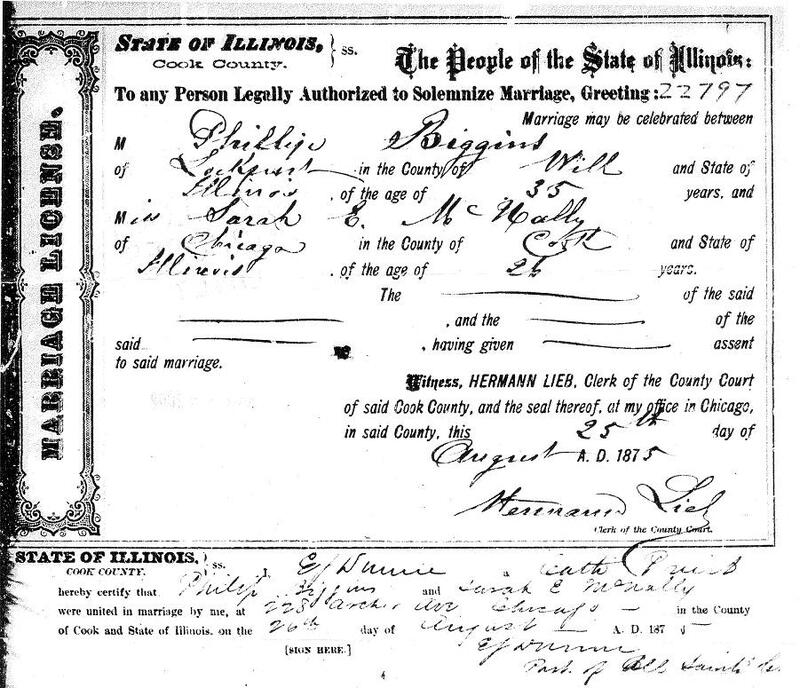 On January 25, 1900, Philip and Sarah's son Leslie, 23, and Emily Foy, 21, were married by Father Francis Xavier Monaghan, C.M., at St. Vincent de Paul Church in the Lincoln Park section of Chicago. Witnesses were Emily�s younger sister Mary (Molly) and Leslie�s younger brother Arthur. The 1900 census shows Philip and Sarah moved four blocks north to 1256 W. 59th Street (1158 W. 59th Street after 1909). Philip was working as a day laborer. The 1900 census shows Philip and Sarah's son Arthur living with them and working as a jeweler. Chicago, New City/Gage Park, 1901-1910. The 1901 city directory Philip and Sarah moved 2.7 miles northwest to the New City section of Chicago at 2408 W. 49th Street (2310 W. 49th Street after 1909). Philip was working as a trackman. St. Michael the Archangel Church had opened in 1898 at 4821 S. Damen Avenue (2000 West). In 1902, Philip and Sarah�s first grandchild, Mary Kathleen Biggins, was born. The 1903 city directory shows Philip and Sarah moved a couple blocks to the 2243 W. 50th Street after 1909). This is a two-story, two-unit frame building that was built in 1889 and is still there. The 1906 city directory shows Philip and Sarah living back at 2408 W. 49th Street (2310 W. 49th Street after 1909). Philip was working as a laborer. The 1908 city directory shows Philip and Sarah living back at 2345 W. 50th Street (2243 W. 50th Street after 1909). In 1909, Philip and Sarah�s third grandchild, Philip Leslie Biggins was born. He was named after his father and grandfather. The 1910 census shows Philip, 69, working as a laborer-gardener. In 1910, Philip and Sarah�s fourth grandchild, John Alfred Biggins, was born. He was called "Al." Sometime between 1900 and 1910, Philip's brother Arthur died. The 1900 census shows Arthur, 19, living at home, and working as a jeweler. This is the last piece of information that we have been able to find about his life. Daniel Philip Biggins remembers being told that Arthur went out West for health reasons. The 1910 census shows Sarah as having had two children only one of whom was still living. The University of Arizona Library reports that at the turn of the century it was believed that the right climate, good food, and rest could cure many illnesses, including tuberculosis. At that time tuberculosis was one of the most common and most life threatening diseases. Early experiments in its treatment included convalescent care and sabbaticals to the Southwest (Arizona, Colorado, and New Mexico) because of the benefit of its arid climate. The St. Mary's Hospital and Sanatorium in Tucson advertised itself as an ideal home for the treatment of tuberculosis. Kewanee, 1910-1911. Sometime after April 1910 and before February 1911, Philip and Sarah moved to Kewanee, Henry County, Illinois. This is where Sarah died. Kewanee is 145 miles west southwest of Chicago. Chicago, Lincoln Park, 1911-1913. With the death of his wife Sarah in 1911, Philip became a widower. He moved to 950 Greenwood Terrace (950 W. Altgeld Street after 1914) to live with his son Leslie and Leslie's in-laws in the Lincoln Park section of Chicago. In 1913, Philip�s fifth grandchild, Richard Vincent Biggins, was born. On or a few days before February 1, 1911, Sarah McNally Biggins, 64, died in Kewanee, Henry County, Illinois, which is 157 miles west southwest of Chicago. Her body was brought back to her son Leslie's home at 950 Greenwood Terrace (950 W. Altgeld Street after 1914). She was buried in Calvary Cemetery in Section D, Block 9, Lot 11. This plot had been purchased by Sarah's mother Bridget and Sarah's brother-in-law John Dempsey to bury Sarah's father 50 years earlier. Sarah was survived by her husband Philip and her son Leslie. BIGGINS�Sarah E., at Kewanee, Ill., beloved wife of Philip, mother of Leslie and Arthur, deceased. Funeral from home of Leslie Biggins, 950 Greenwood terrace. Further arrangements later. On November 30, 1913, Philip Biggins, 72, died at 950 Greenwood Terrace (950 W. Altgeld Street after 1914) of chronic interstitial nephritis. Following a funeral Mass at St. Vincent's Church, he was buried next to his wife Sarah at Calvary Cemetery in Section D, Block 9, Lot 11. Philip was survived by his son Leslie. BIGGINS�Philip, beloved husband of Sarah E. Biggins, deceased, father of Leslie and Arthur. Funeral from his late residence, 950 Greenwood terrace, Tuesday, Dec. 2, 8:30 a. m., to St. Vincent�s church, by automobiles to Calvary. Philip was also survived by his older sister Ann Biggins Gaffey. The 1910 census shows Ann living with her daughter Maggie Gaffey Rowe at 7138 Bennett Avenue in Chicago. 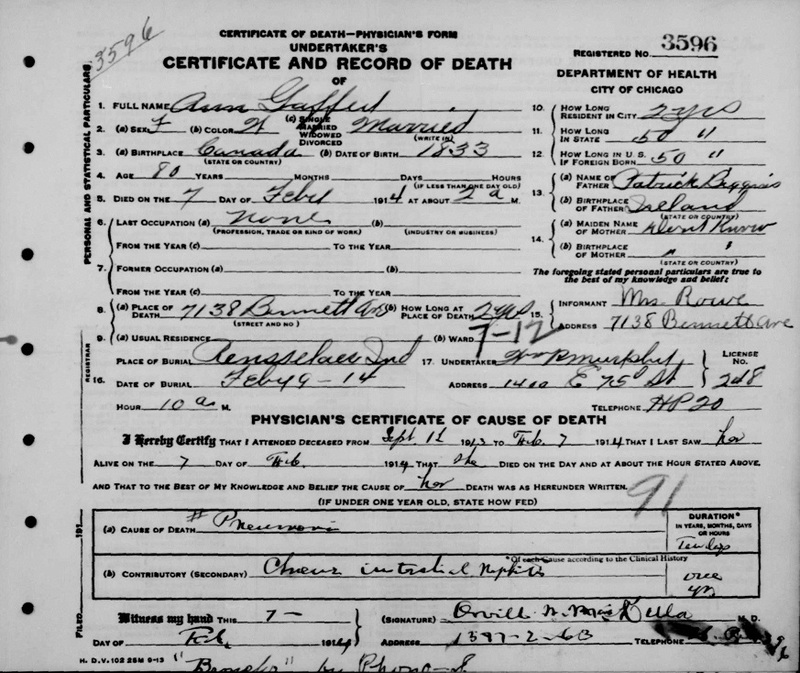 Ann died a couple months later on February 7, 1914 (death certificate).